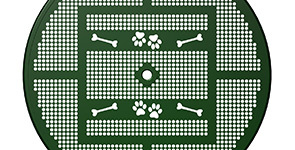 Outfit public dog park communities to enhance enjoyment for all guests with Chow Hound Tables. 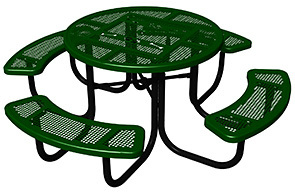 Coordinating perfectly with the whole collection of BarkPark® amenities, these all-steel round picnic tables display charming laser cut bones and paw prints detail styled on the large perforated table top. Accommodating pups and owners, Chow Hound dog park tables have a 46" table top surface area for dining/relaxing and durable 1-5/8"O.D. frames reinforced by a 1-1/16"O.D. brace. Table and seat tops are finished in a reliable thermoplastic coating while frames are powder-coated, delivering top protection and lasting appeal.